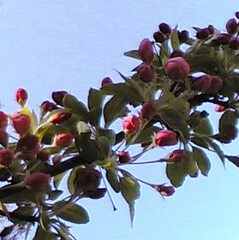 Fruit trees are getting ready to bloom around here, so today I took some pictures with my phonecam. Later, I cropped this closeup image out of one of the pictures, trying to focus attention on the brightly colored buds against the sky. That's what they say, though I have always thought they look more purple than blue, but nothing rhymes with purple. 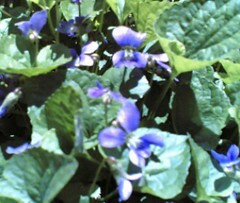 I have been noticing the violets coming up everywhere, so I took a picture with my phonecam. 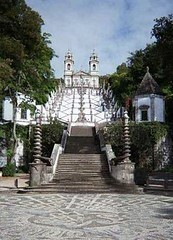 This is the staircase at Bom Jesus, near Braga, Portugal, that I mentioned a few days ago. Recently, I was looking for a good photo of the place, but realized that I only had one photo of the staircase, taken by a friend while Mauro and I stood in front of it. I was so happy to have finally made the trip to Portugal! After I found the photo, I decided to see if I could copy it and use it to create an image with an unobstructed view of the staircase. I opened the copy in Painter IX, did some cut and paste and used a little digital pastel. Then I cropped the image to improve the composition. The original photo is intact, and naturally I will always prefer that image as a wonderful souvenir of my very first trip to Portugal. But still, I had fun practicing some digital sleight of hand, and creating a little disappearing act with Painter IX. Yesterday I phoned my aunt in Colorado. She has recently started making jewelry and she loves it! We compared notes on the fun of making jewelry and talked about the addictive quality of bead stores. When you travel or go shopping, you are always on the lookout for beads to buy. 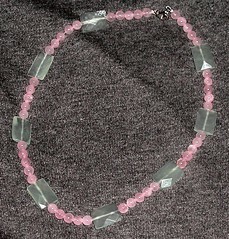 Here is a necklace I made last year; I remember finding the jade in a little bead shop on 7th Avenue in New York. Anyway, it was fun comparing notes about jewelry-making with my aunt, and I am looking forward to seeing her work the next time I get a chance to take a trip back home. Due to an unfortunate mishap, my old cellphone is no more. (I shall remain silent about the details except to say that the mishap was hilarious and that it involved water. )So now I have a new cell phone with a new camera, which I tried out on my walk this morning. I love the way the morning light looks on flowering trees, so I took this picture. I also wanted to get a sense of what this new camera would do, and I learned that this camera has a much sharper resolution (see the details in the background). Even though I did like the soft effects of the lower resolution in my old phonecam, it will be nice to be able to get this much detail, especially considering that I reduced the size of the image for posting. In art, each tool is different, and that goes for cameraphones, too. The trick is to learn to use each tool, and figure out what it does best. I took this picture during my short stay in London a few years ago. We went to the British Museum on a rainy day. Afterward, we explored some bookstores close to the museum. I remember standing in the doorway of the bookstore and taking this picture of the street scene across the way. Tonight, Mel was watching "84 Charing Cross Road," a movie (based on the book) about a small London bookstore. 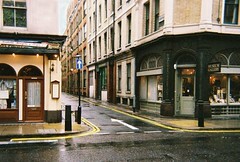 Well, this is definitely not Charing Cross Road, but the movie reminded me of London bookstores and of this image. The picture was easy to find, but not quite ready to post. So I cropped it, then opened it Painter IX and cleaned up a bit of street litter with digital pastel. Then I added a little color to the sky and intensified a few lines on the buildings just to add contrast, using colors that were already in the photo. I wouldn't call this image a fantasy, but it has been digitally modified, so I guess you could say it is a bit of a London daydream. 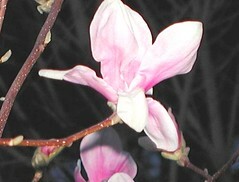 The magnolia trees are in bloom. 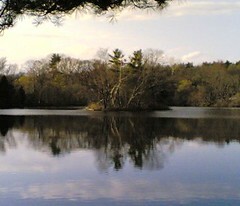 It was too cold and rainy today to go out and take pictures, so instead I cropped this image from a picture I took last spring with my digital camera. Magnolia trees bloom all of a sudden, and often, the blooms don't last. But the photos do! I took this picture on my most recent trip to Colorado. 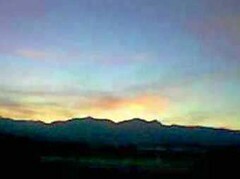 I love the way the mountains look at sunrise and at sunset. Here is a photo I took recently with my cameraphone. 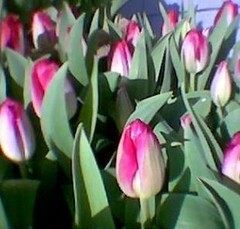 These tulips look they are having an April celebration! This is a picture I took during my first trip to Portugal. This is the outside of a souvenir shop in the park at the top of Bom Jesus (famous for its enormous white staircase that leads up the mountain. Yes, I did climb all the way to the top.) I certainly enjoyed the vistas panoramicas (panoramic views), but even more I enjoy just visiting and experiencing life in Portugal. 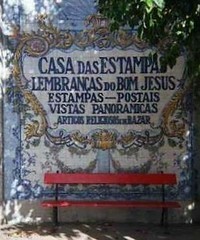 I took this picture because I loved the tile, the sign in Portuguese, and the little red bench in the shade. When the weather warms up, everything seems to bloom at once. 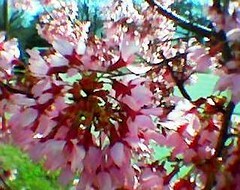 While I was taking a morning walk on Sunday, I came across this little tree with pink and red blossoms. Because the tree was small and was growing right next to the sidewalk, I had an opportunity to get a closeup picture with my phonecam. Over the past few weeks, we have had some warm days, interspersed with cool ones because, after all, we are north of Boston. And now bright yellow forsythia is blooming all over the place. The sun was shining when I took this picture, but I think that forsythia looks like sunshine, even on a cloudy day. I have tried to get some good pictures of forsythia, but usually the bushes are too far away, and the color just doesn't hold up at a distance. 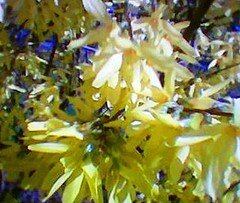 But on a recent walk, I came face to face with a forsythia bush, so I took this picture with my phonecam. After I loaded the image into the computer, I still had to play with the saturation just a bit to get that bright, sunny yellow. The other day, walking where I often do, I looked down and saw a path I had never noticed before. 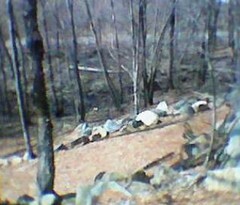 I liked the shapes of the rocks, and the trees, and the path itself, so I took this picture with my phonecam. Isn't it funny how easy it can be to miss a clear path? But sometimes all it takes is a change in perspective, and there it is! This is a picture I took on a slushy winter day as we were driving down Boyleston Avenue. I always think of Boyleston Avenue during the Boston Marathon (which is tomorrow) because that is where the finish line is. 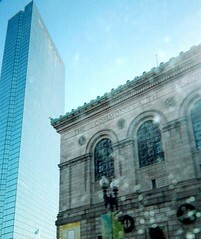 What I like about this image is the juxtaposition of two Boston landmarks, the John Hancock Building and the Boston Public Library. I thought the weather was against me when I took this picture, and you can certainly see its effects in the photo. At first, I defined that as a problem and tried to fix it, but have decided that I kind of like the effect. Anyway, this seems an appropriate image for the Boston Marathon, and for all those runners who carry on, even when it seems that the weather might be against them. It's time for another nice memory of Portugal. Mauro showed me around Cascais when I visited in July of 2004. 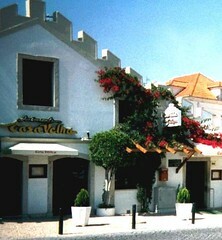 Cascais is a very lively beach town, with lots of white buildings and colorful flowers. I took pictures of one of the main streets, but sometimes it is better to capture the feel of a place with a closer look. So tonight I cropped this image from one of my photos. I think it communicates a sense of Cascais looks like. Taking photos in the bright sunshine of Cascais was a challenge; I adjusted the contrast, but not too much because the bright light and dark shadows are part of the experience. But after all that, there was a pesky television antenna that was creating a distraction in the background, so I opened the image in Painter IX, and used a little digital airbrush to create a clearer view. 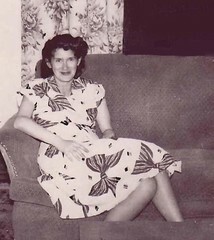 I was looking for a nice picture of my mom, and I found a snapshot that I liked in an old album. I especially liked the patterns in black and white. But there were some problems in the original photo: lots of clutter on the coffee table, and in the background, and even an upended porch chair visible though the window! But I really thought the snapshot had potential. So I scanned the photo and opened the image in Painter IX. I used some cut and paste to get rid of the porch furniture, and digital airbrush to neaten up some stray marks (and while I was at it, her cigarette). Then I cropped the image to get the composition that I wanted. Today a cousin called me from Times Square; she is in New York for Passover. It was fun hearing about her visit and comparing notes on seders we have known over the years. As we talked, I could hear the sounds of Times Square through the cell phone. Afterwards, I found myself daydreaming about New York City. 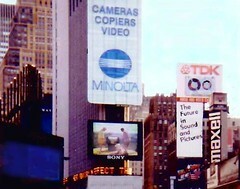 So I cropped this image out of the background of a photo I took in Times Square several years ago. Then I opened the image in Painter IX and used digital airbrush to add some color and contrast. I call this a daydream not only because I was remembering great visits to Manhattan, but also because this image has been digitally modified. I used my phonecam to take this picture during my pre-Passover grocery store run. I noticed the slogan on the matza box (Streit's) said "the taste of memory." I think that's right, so if it's Passover, then it is time to cook and make memories. 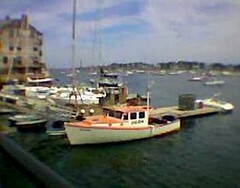 I took this photo of the Marblehead dock last summer, using my cell phone camera. I have been picturing this dock for the past few days, because I have started reading a new Robert Parker novel called Sea Change, set in a Massachusetts town north of Boston that strongly resembles Marblehead. Part of the action takes place at the city's dock, as in this photo. I started reading Robert Parker novels when we moved to the Boston area. They are great reading, and as a bonus, a great way to explore the Boston area. No time for a break today, but I did have to make a grocery store run. 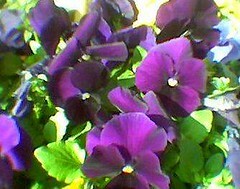 And I was happy to see pansies for sale outside the store in the afternoon sun. Here north of Boston, that's a sign of spring (and the optimism of New Englanders). 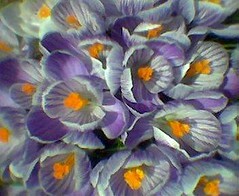 I liked the way the dark purple pansies looked when the sun hit them, so I took a picture with my cameraphone. Later, I loaded the image into my computer and cropped it just a bit. Pansies always make me stop, look, and smile. 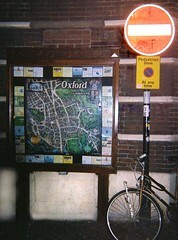 I took this picture in Oxford during a trip a few years ago. We were driving down to Heathrow so I could catch a flight. We only had time to stop for dinner, but I could tell I would like the place! It looked like a typical university town, lots of fun to visit! Too bad there was no time left. This is the only picture I have (I guess I was out of film as well as time). Mel is making another quick trip to another British university town, so I decided to post this little souvenir of Oxford. But first I opened it in Painter IX and cleaned it up with photo tools and digital air brush. 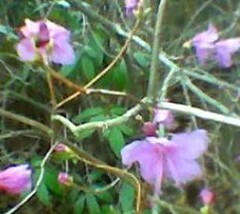 Today it was cloudy and almost cold, so I was surprised and excited to see these first pink blossoms. I took a picture with my phonecam, then loaded the photo into the computer and cropped it to improve the composition. But after taking a look at the image on the computer screen, I decided that there were too many distracting areas in the background. So I opened the image in Painter IX, and with the airbrush tool, did a little digital yardwork. I was looking through my pictures tonight, and found one that needed to be rescued. I took this photo at the beach during our very short trip to Cape Cod a few summers ago. But the original version had problems with the color and composition. I started by corrected the color of the sky, which was almost chartreuse (which can be interesting, but not in this case.) 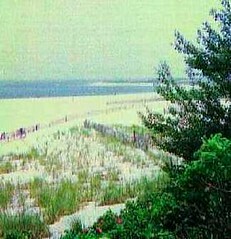 Then I cropped the picture to focus on the visual information that was the most interesting: the lines of the horizon, the beach and the fence, framed by the dark foliage in the foreground. The weather is slowly improving, and we have better walking weather. 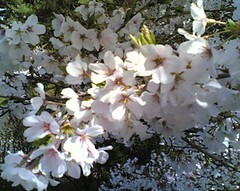 This is a picture that I took with my phonecam on a recent walk. I spotted these little purple flowers next to the sidewalk. I don't know what kind they are, but I call them those little flowers that look like purple stars. 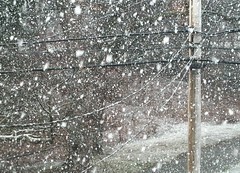 We had a surprise snowfall this morning, great big flakes coming down thick and fast. I grabbed my digital camera and took a few pictures through the window. I didn't think the snow would last, and I was right. The snow soon turned to rain, and it has been raining the rest of the day. 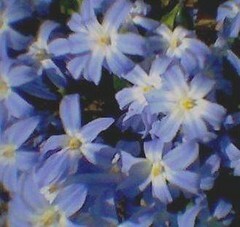 I call these electric flowers because they are made of pixels. 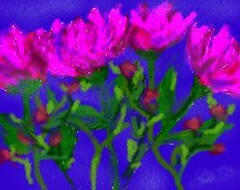 This is a piece of digital art that I started on my Clie handheld paint program. I have been getting a "fatal exception" message when I try to synchronize my Clie, and though that only affects the Palm software, still it might be time to look into a new handheld and the new Palm Paint program. But I love my Clie and I hate change. So I am trying out a new cradle to see if that does the trick. We shall see. Meanwhile, while I was sitting at the computer waiting for my Clie's batteries to charge, I decided to finish this little digital sketch. So I opened it in Painter and used digital pastel to add more flowers, clean it up, and use some transparent layers to soften the image. In the midst of my frustration about my handheld, it is good to remember that technology can be a good friend to art; you just have to take the time to get acquainted. This is a picture of my parents, during their honeymoon trip to New York. 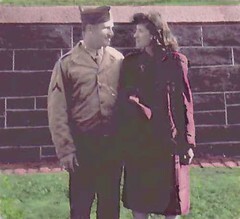 I found the original image tonight, a small snapshot in my mother's album. (She pasted photographs on black paper and wrote about the pictures in white ink.) I didn't remember seeing this image before, but I liked it immediately. So I scanned the image into the computer. First I restored the black and white image, cleaned it up with digital scratch remover, and rotated the image to straighten it out.. Then I opened it in Painter IX and did a little cut and paste to get rid of a distracting tree trunk. Next, I cropped the image, and saved it as a black and white picture, which I like enough to keep just as it is. Then I created a copy in Painter IX, and used transparent digital watercolor to see if I liked the effect. I decided that I liked it so I kept going, and here is the result. It's a lot of fuss over a snapshot, but I was very happy that I found it! Today it was cool with gentle rain and mist, a reminder that it is still very early spring. Here's a photo to match the day. This is from a batch of photos I took in early spring of last year, on a misty spring day when the daffodils were in bloom. It was a Sunday and I took a morning walk on the campus of Endicott College, taking pictures with my phonecam as I walked along. I was following one of the many paths across the campus when I saw this tree. 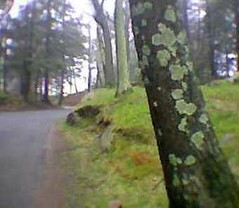 I liked the pattern that the moss made on the tree, so I took this picture. Today Heather suggested a walk on Singing Beach, so we took the dogs up to Manchester-by-the-Sea. It was warm but windy, and as usual, loads of people were walking up and down the beach, most of them accompanied by their dogs. Besides the hilarity of hundreds of dogs playing on the beach, we had a beautiful show of sound and color. 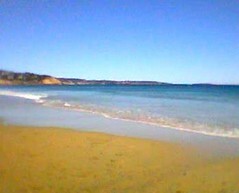 The water seemed to sparkle because of the wind, and the waves were crashing and roaring on the sand. I was looking at the different colors that were in the water today, from the deep blue at the horizon to the subtle periwinkle blue reflected by the water over the wet sand. I wanted to capture those layers of color, so I took a few pictures of the ocean with my phonecam, and this is the one I like the best. Yesterday the temperature shot up to 75 degrees, and apparently the flowers took notice! A bunch of crocuses that had been closed the previous day were suddenly wide open! I liked the patterns and colors so well that I took a picture with my phonecam. When I looked at the image today, I was bothered by one flower in the upper left that looked more white than purple, and because it was in the corner, was too much of a distraction for the composition. So I opened the image in Painter IX and using digital airbrush, I put a transparent layer of very light purple over some areas of the flower. It is a very subtle change, but I am announcing it here in the interest of full disclosure.